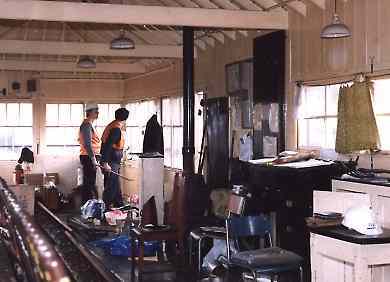 After closure of the box in 1985, the Exeter West Group moved in and carefully dismantled the signal box, marking each of the hundreds of parts for future reference. The first task was to safely remove all furniture, then dismantle the massive lever frame. And then the building itself could be dismantled, piece by piece, until nothing was left but a pile of bits. 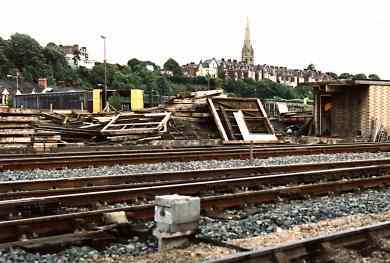 At first, all of the parts were moved to Bristol and a start was made on restoring the box there to be a feature at Temple Meads station. 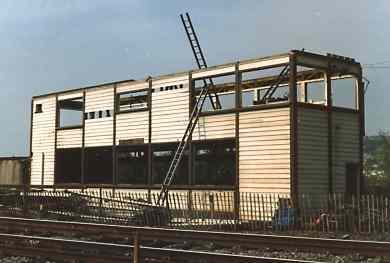 However, by Summer 1988 it was clear that this project had foundered, but a home was offered at the proposed Swindon Heritage Centre. Everything was moved there, and restoration work continued until 1990. By this date, the Group had done about as much as they could to the huge collection of pieces in their possession, but a seemingly indefinite postponement of the heritage project at Swindon made it necessary to seek another home. Finally a home was found for the box as part of the Crewe Heritage Centre displays at Crewe, and everything was moved again and a start made on re-erection.